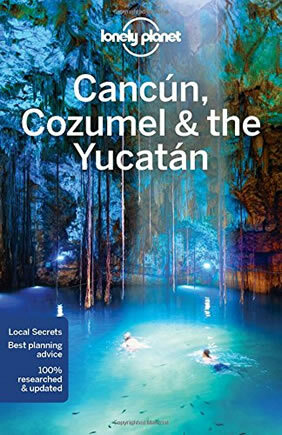 Cancun, Mayan Riviera, Tulum, Tihosuco, Vallolidad, Ek Balam, Dzidzantun, Xcambo, Merida, Uxmal, Chichen-Itza, Holbox, and more! This New Year’s Eve travel to the Yucatan Peninsula to be immersed in the history of Mayan civilization while exploring ancient temples. Join a fun gay group to climb the ruins, walk along an endless white sandy beach in Holbox, swim in a deep blue cenote, and learn about the Spanish conquest of this ancient land. The Mayan civilization and all of its extraordinary accomplishments have been referenced by hundreds of scholars. Our gay trip features the history of the Mayans, their calendar, and their sophisticated system of mathematics. 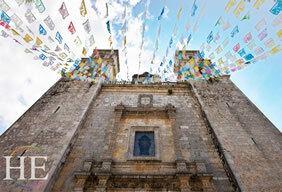 The fascinating culture and history of the Yucatan peninsula is eclipsed only by its rich coastal beauty. A colorful glimpse of ancient, colonial, and modern Mexico. We’ll fly into the Cancun International Airport and be met by a shuttle that whisks us south toward the Mayan Riviera, to our lovely resort on the coast. For those arriving early in the day, there will be time to lounge on a cabana overlooking the craggy coast or take a dip in the pool. Tonight we will enjoy an intimate welcome dinner together to kick off our journey. Each day of sightseeing and adventure begins after our included breakfast. 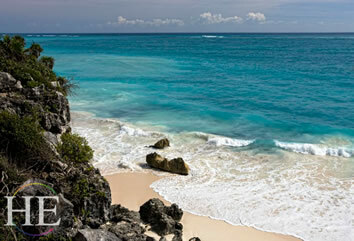 Today we will visit Tulum and have our first introduction to the fascinating history of the Mayans. One of the last Mayan cities to fall to the conquistadors, Tulum overlooks the Caribbean Sea and is noted for its high walls and strong defensive position atop great cliffs. We’ll head inland to another famous Mayan site, Cobá, which may have housed 50,000 residents at its peak. This afternoon we suggest a disco nap, as tonight we are off on a journey of seduction and desire as we catch Tulum’s newest and raciest attraction, the Rauxa Cabaret! Today we begin our journey westward, including a city tour of Valladolid, one of Mexico’s “pueblos magicos” or “magic cities,” designated by the country because of it’s natural beauty, cultural riches and historical significance. We will marvel at the largest privately owned collection of Mexican Folk Art at the “Casa de los Venados” or “House of the Deer,” then continue on to Ek Balam, a Mayan archaeological site famed for its detailed stone carvings, intact stucco figures, and steep steps. We will have plenty of time to climb and explore several of the temples and other structures before we continue to Cenote Hubiku. There, we’ll swim in a crystal clear pool in an underground cavern among stalactites and stalagmites! 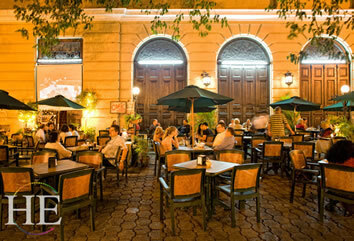 We’ll end our journey in the state capital, Merida, where we’ll find plenty of restaurant choices for our independent evening meal. Mérida has the highest percentage of indigenous persons of any large city in Mexico with approximately 60% of all inhabitants being of the Maya ethnicity. The colorful architecture of the city reflects Mayan, Spanish, and other European influences, and we will learn about it on our city tour, also visiting Merida’s version of the Champs Elysees, the “Paseo de Montejo” and even take a ride in a horse drawn carriage. Tonight we say goodbye to 2019, and we’ll celebrate in style with a delicious traditional New Year’s dinner together! We’ll have time to walk it off afterwards when we head out for a tour of Merida’s gay nightclubs and ring in 2020 right! You’ll notice that many people will be in town for the special New Year’s Day mass at the impressive Merida Cathedral, one of the oldest in the Americas. The New Year's Day will be free to explore this bustling city and dine independently. Day 6 - Feliz Año Nuevo! 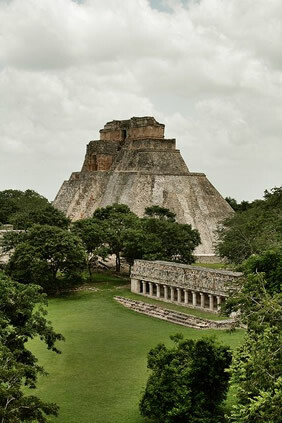 We’ll rise early today to visit the breathtaking ruins of Uxmal by day. 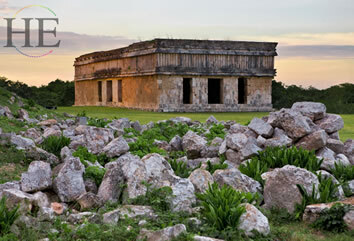 This large archeological site has a legendary tall temple, the “Pyramid of the Magician”, a huge courtyard, and more. The structures are adorned with intricate geometric stone carvings and many sit atop opposite hills as well as nestled in the valley in between. More adventure awaits at the impressive Lol Tun Caves with our private guide. From the top to a pyramid to deep underground, we will see it all on the second day of the New Year! After breakfast, we are on the move, off to Hacienda Sotuta de Peon, for a tour of the airy Spanish home and working museum. The factory tour showcases the modernization of sisal production and the conditions of slavery that supported the industry during the last century. 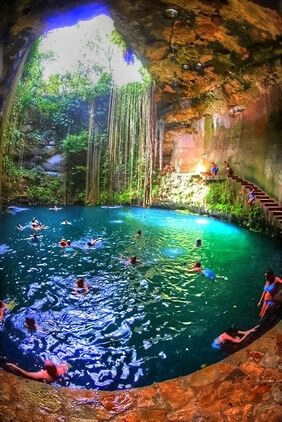 Later we’ll take a wagon ride to the private cenote and descend into the cavern to swim in the clear blue water. Our colorful cottages await tonight, and dinner will be delicious. 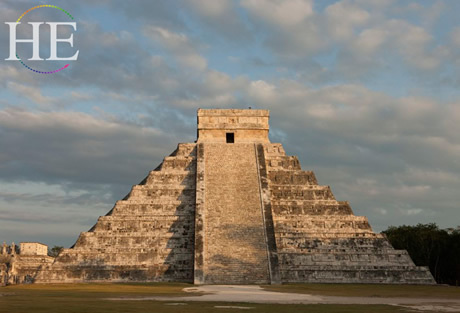 Today pass through the towns of Tecoh and Euan as we head toward what is sure to be one of the most amazing sites we will visit on our tour, Chichen Itza. 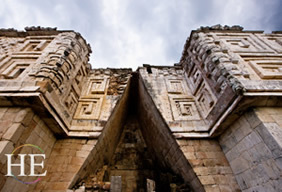 This site is a vast complex of temples and other intricate structures including an observatory. Local vendors line the shady walkways between temples and sell colorful hand-painted pottery, instruments, and textiles. Afterward, we will embark on a few hours drive northeastward for the city of Chiquila. From there, we glide across the breathtakingly blue bay to the island of Holbox (pronounced hol-bosh). Once on the island and checked into our beach cottages, we’ll have time to stretch our legs walking along the beach or strolling the tiny island town. We regroup for a lovely dinner together. Today is a full day to relax on this charming island. Some will read by the pool, enjoy a relaxing massage, or stroll and shop in the village. Others may like to rent a golf cart and explore or take a horseback ride along the beach. We have included a snorkeling tour today for any guest who wishes to participate. Please let us know in advance! We’ll enjoy a farewell dinner and remember our warm and colorful week together. Today we have arranged the ferry and shuttle that will take us to the Cancun Airport. We’ll bid adios to beautiful Yucatan, Mexico! Flights should be scheduled after 3 PM on the last day. • Services of knowledgeable, full-time, bilingual national guide and HE Travel Tour Director (pending minimum participation). • Personal items including: alcoholic beverages, snacks, laundry, and telephone calls; gratuities for guides and HE Travel host. This tour starts in Tulum and ends in Holbox, Mexico. The nearest airport is in Cancun, and transfers will be provided to Tulum and back from Holbox. Arrival: Plan to arrive in Cancun before 3 pm on December 28. Departure: Schedule departing flight from Cancun after 4pm on January 6. An additional fee for private transfers may apply on dates other than shown above. This trip includes walking on uneven paths among the ruins including going up and down steps and hills. 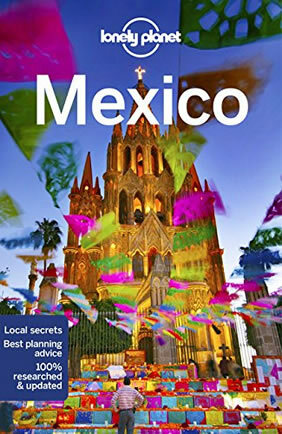 Anyone who can comfortably navigate through historic sites and walk on city streets, dirt paths and sandy beaches will enjoy this gay Mexico trip. Most of our trips draw more single travelers than couples. When couples do join us, it's usually because they're looking forward to interacting with a gay group; if they wanted a holiday by themselves, they wouldn't have signed up to travel with us. Furthermore, the activities included with our trips serve as natural ice-breakers. Within a day, you'll be traveling with friends. You don't need to pay the single supplement if you're traveling alone. We'll be happy to match you with a roommate. Pay the single supplement only if you want a bedroom to yourself..